Officials with the Chinese Consulate General in San Francisco today urged U.S. officials to make a full investigation into the death of a Chinese teenager who was struck by a fire truck and killed after surviving the crash of Asiana Airlines Flight 214. San Mateo County Coroner Robert Foucrault today confirmed that Ye Meng Yuan, a 16-year-old student, was fatally struck by a San Francisco Fire Department vehicle in the July 6 incident. 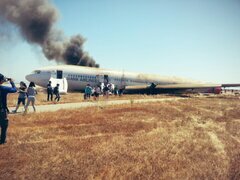 See all SF Appeal coverage of the crash of Asiana Airlines Flight 214 here. In a statement, Consul Wang Xiang noted the efforts by officials to “disclose the truth,” but called for further investigation. “We urge the involved parties of the U.S. side to deal properly with the aftermath of Mengyuan’s death and investigate and affix responsibility for this tragic accident,” the statement read. Ye was still alive after the plane landed, but died after suffering multiple blunt-force injuries consistent with being run over by a vehicle outside of the plane, Foucrault said. Ye’s friend, 16-year-old Wang Lin Jia, was also pronounced dead at the scene of the crash, while a third Chinese student, Liu Yipeng, 15, succumbed to her injuries at San Francisco General Hospital nearly a week later. San Francisco Fire Chief Joanne Hayes-White said investigators believe Ye was struck by a specialized fire truck based at the airport. The girl was on the ground covered in a blanket of foam used to suppress flames when she was struck, Hayes-White said. “Obviously it’s devastating news to us,” Hayes-White said. Since then, the fire department has apologized to Ye’s family and is continuing to reach out to them via the mayor’s office and the Chinese consulate in San Francisco. The chief said she has yet to meet directly with the family, but has offered to sit down with them. She said the department is reviewing its procedures in light of the incident. “Every aspect of our response that day is under review,” the chief said. The San Francisco Police Department is also investigating the incident. San Francisco Mayor Ed Lee said today that he regrets the tragic death. “Our hearts are heavy, and our thoughts and prayers continue to be with their families and friends an ocean away,” Mayor Lee said in a statement this morning. Lee praised the “quick response and heroic decisions of our first responders,” who he said were able to save many of the 307 passengers and crewmembers onboard. More than 180 people were injured in the crash. The cause of the accident remains under investigation by the National Transportation Safety Board.